— Amy Einsohn. The Copyeditor’s Handbook: A Guide for Book Publishing and Corporate Communications. Berkeley: University of California Press, 2011, p. 4. I am an editor and independent scholar who has been helping people with their writing for over twenty-five years. I have worked as an editor, proofreader, and tutor, and I write literary criticism about Medieval and Renaissance English literature. 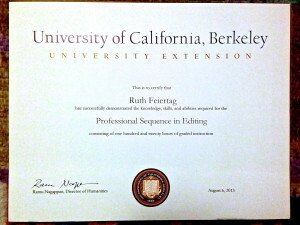 I have a certificate from the the University of California, Berkeley’s Professional Sequence in Editing. It looks very nice next to my BA from UC Santa Cruz and the MA from the University of Colorado at Boulder. Like most editors, I am a voracious reader. Like Jorge Luis Borges, “I cannot sleep unless I am surrounded by books.” Like Anna Quindlen, “I would be most content if my children grew up to be the kind of people who think decorating consists mostly of building enough bookshelves” (find Quindlen’s article here). Developmental editors “thrive on exercising their particular knack for putting themselves simultaneously in the author’s and the reader’s places …” (p. xii). — Scott Norton. Developmental Editing: A Handbook for Freelancers, Authors, and Publishers. Chicago and London: University of Chicago Press, 2009. I love language — words, sentences, articles, books. I think that most of us apprehend our world, our selves, through the concepts language gives us, and that it is through language that we, like Shakespeare’s Antony, “find out new heaven, new earth” (Anthony and Cleopatra, I.i.21). I never forget when I am editing that the author whose work has been entrusted to me has written words meant to be read and and to engage or even captivate a reader. My experience ranges from my first job as a free-lancer for the academic Berg Publishers, Inc. of Rhode Island (back when one proofread manuscripts on paper using a red pencil and edited using a blue one) through an assortment of other editorial positions to my current status as an independent contractor. I have edited newsletters for Brown University’s Sarah Doyle Women’s Center, the Boulder Writers Alliance, and the National Coalition of Independent Scholars. I was the Book Review Editorial Assistant for the academic journal English Language Notes for several years; I recently proofread A Blackbird Sings, a book of small stones poetry edited by Fiona Robyn and Kaspalita (Malvern, England: Woodsmoke Press, 2012). 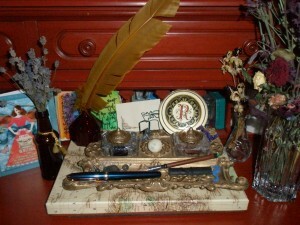 I am also the Senior Editor for Regal House Publishing (http://www.regalhousepublishing.com), an independent publisher of literary fiction. I have augmented my experience with classes on various aspects of editing. 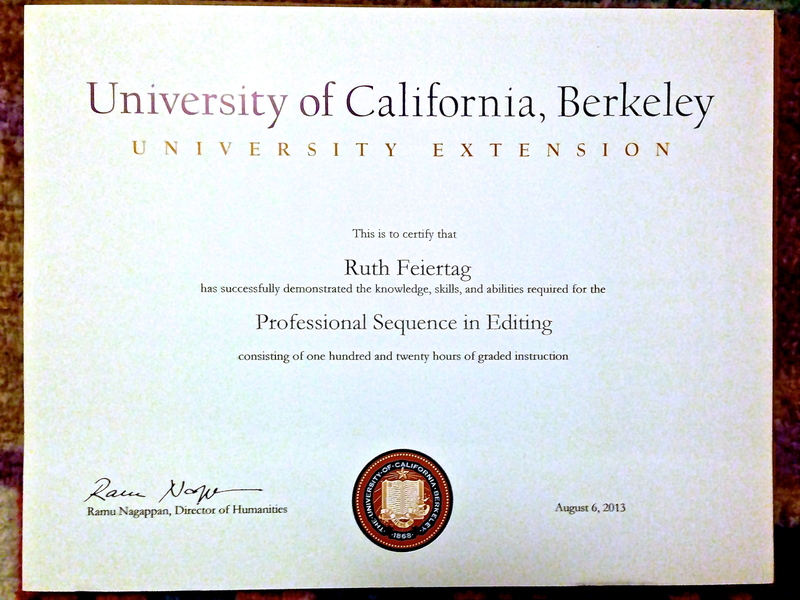 Back when I was starting out, I took Brown University’s “Workshop in Teaching Composition” and an extension course in “The Craft of Editing.” In addition to UCB’s recent “Sequence in Editing,” I also taken several editing courses taught by Alice Levine of the Denver Publishing Institute. However, the most valuable editing experience I had was not as an editor but as a tutor. For many years I was the lead instructor for the Disabled Students’ Writing Lab at the University of Colorado. The students who used the Writing Lab were bright and hard working but often had rigid learning styles that didn’t allow them to adjust to the various instructional approaches they encountered. Because the students couldn’t modify their orientation to learning, I had to be flexible and adaptable in ways that made me a responsive and attentive editor. I still look at editing as a collaborative, give-and-take process in which author and editor learn from and teach each other through the medium of the manuscript.